Supreme Court has ruled it has found no grounds to nullify the results of the presidential elections held in Maldives on September 23. The petition to nullify the results of the presidential election was filed by President Abdulla Yameen Abdul Gayoom, who alleges the election was rigged. Supreme Court issued its verdict on the case this Sunday afternoon. The court made its judgement with the unanimous vote of all five Supreme Court judges. The court ruled there was no grounds to nullify the results of the election. And that the appellant failed to provide sufficient evidence or constitutional reasons why the election should be nullified. The Supreme Court noted in its verdict that the burden of proof in such cases fell on the appellant, and that though Yameen made multiple claims, he failed to provide sufficient evidence to back the claims. The court said the decision to contract M7 to print ballot papers cannot be taken as a decision to provide a company owned by a certain individual with a particular political leaning with the opportunity. It said there was no evidence to support the claim the decision to contract M7 to print the ballot papers was made with the intention of benefiting a particular individual or individuals. Yameen had questioned the security at the room where the ballot papers were stored. 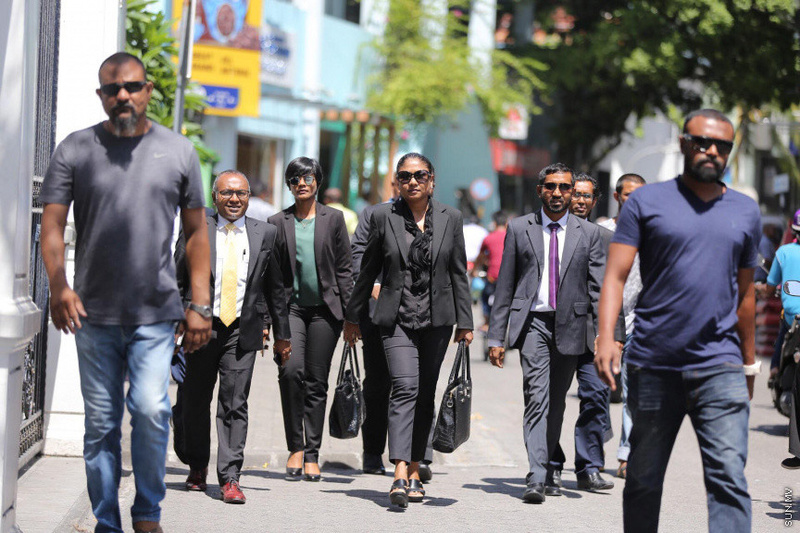 The court said the Maldives Police Service has not disputed with the EC has attestation to the strength of security at the room, ahead of the election or afterwards. Security at the room where the ballot papers were stored was maintained by the Maldives Police Service. And in response to the claim made by Yameen that the ballots were printed on paper which could make ink disappear and that rings which could work as pens was used to alter ballots; the court said Yameen failed to specify at which polling station or polling stations the alleged incidents took place, or specify whether alterations were made to ballots using the rings or the paper. The court also noted that there was no record of number of voters who used pens provided by the EC and those who used their own pens. It ruled that there was no evidence to support the claim such items were used to alter the results of the vote. Yameen’s petition also claimed that the Elections Complaints Bureau was shut down, resulting in people being unable to submit election-related complaints. But EC had denied the claim at court, and testified that the Bureau had been fully functional. The court noted in its ruling that Yameen failed to disprove EC’s testimony. And in regard to the claim by Yameen that polling booths were positioned in such a manner that it was prone to influence, the court said Yameen failed to specify the polling station where the alleged incident took place. The court also rejected Yameen’s complaint that UV lights weren’t used on all the ballot papers to test its authenticity. The court said no law compelled officials to check ballot papers under UV light. The court also said that EC explained the extra ballots in some of the ballot boxes, and that one incident wasn’t a pattern to prove other ballot boxes also had extra ballots. The court also said that some people bringing in handbags into polling stations wasn’t proof they had carried extra ballot papers into the station. The Supreme Court noted that it is established in law that the results of an election can only be nullified if there is evidence of a wrongdoing which could have affected the results of the election. But that Yameen failed to provide evidence of any such wrongdoing. Yameen requested in his petition to order Maldives Police Service and Maldives National Defense Force to run a criminal investigation into the claims of election rigging he made. He asked that the investigation be run under the supervision of the Supreme Court. EC, during legal proceedings on the petition had said the petition was based entirely on hearsay. And that it did not deserve to even be called claims. The opposition coalition, which joined the proceedings as a third party, also said the petition was based on hearsay, without any evidence to back it. Supreme Court noted in its ruling that the court has the authority to order such an investigation. And that the Prosecutor General’s Office also has the authority to order investigations if a major crime is suspected to have taken place. And that the People’s Majlis has the power to summon the Elections Commission for an inquiry. The court, however, said there was no basis to order any State institution to run a criminal investigation into the claims made by Yameen, based on the evidence he submitted in the case. A large crowd of people gathered outside the Supreme Court to celebrate after the court issued its verdict. No PPM lawmaker or government official was in attendance at the courtroom at this Sunday’s sentencing hearing.